The Durango set was also a JCPenney Christmas Catalog item in 1976. Heralded as "The greatest western train set of all time," the 1976 TYCO line introduced the GP-20 (No.228-30) in brown-and-orange Kansas-Durango-Colorado paint. The set also offered the Operating Floodlight Car (No.347B) in the Durango paint, as well as the 40' Stock Car (No.312G). 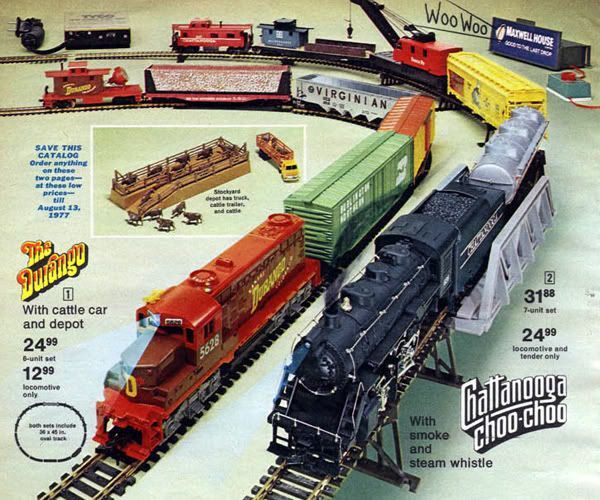 For 1977, TYCO adds a Durango Steamline Off-Center Cupola Caboose (No.327-30). For nearly every TYCO offering, there seems to be variations in paint or other aspects of the model. The Durango diesel is included with the pre-production Durango GP-20 model displayed in the 1976 TYCO Catalog that rides on AAR trucks and has a red cab number. Production examples favor the image shown above with white cab numerals and EMD Blomberg trucks. 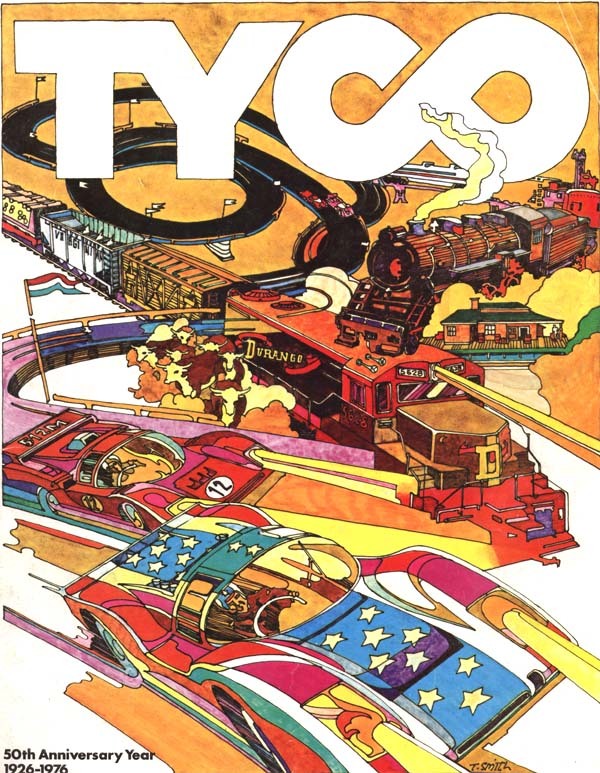 TYCO included the Durango GP-20 in the annual catalog cover illustration for the set's introductory year of 1976. This was also TYCO's 50th anniversary yeard. 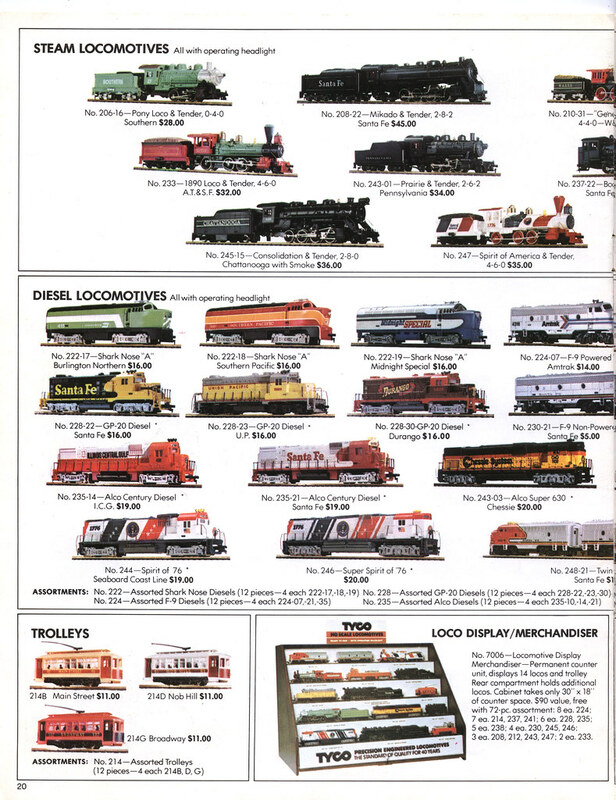 The Durango train set returns for a second year in the 1977 TYCO catalog.